Gillette Venus Oceana disposable razors for women combine three blades, a rounded pivoting head for hard-to-reach areas plus a comfort grip handle for great control. 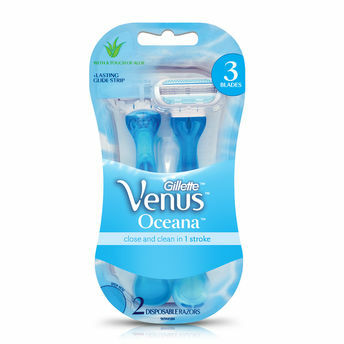 Venus Oceana has 3 razor blades surrounded by soft protective cushions and a Moisture Rich Strip with lubricants plus a touch of Aloe, for great glide. Each package contains three Venus Oceana disposable razors for women. Specially designed handle for great control. Pivoting head fits easily in hard-to-shave areas. Close shave and touchable smooth skin.